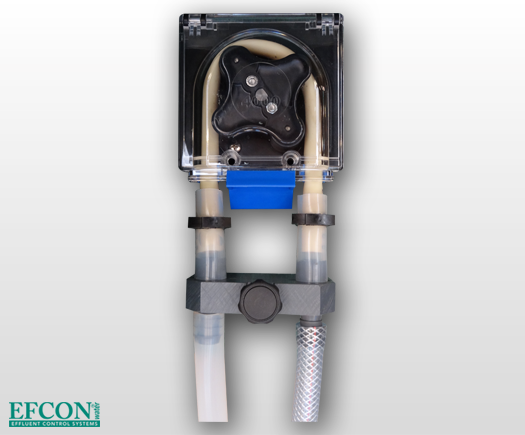 Efcon® Peristaltic Sampler are equipped with reliable basic hardware and standard electronics. Although the design is focussed on long term reliable sampling with minimum drop out the maintenance frequency at permanent use is absolutely higher than a Vacuum Sampler. The peristaltic sampler can take samples from open channels or wires and has a with DN 12 or DN 9 mm tubing. Commonly used on wall mounted Carrybox Enclosures and portable samplers (released end of 2015). Mount the end (inlet) of the suction hose on a fixed representative turbulent point to sample homogeneous wastewater. Ensure the suction hose is always emerged in the wastewater / medium. Not allowed for billing purposes in the Netherlands! A peristaltic sampler needs regular cleaning of the sampling hose and water level detector. The contact level indicator functions on a minimum wastewater conductivety of 50 m/s. When the conductivety drops to deep (in case of demi or pure rain water), an optional capacity switch can be added to create a full functioning level detection system.